Oxford United loanee Jordan Graham says he hopes he can extend his stay with the League Two club. The Wolves' winger, 20, has made five appearances for the U's with the last game of his initial one-month loan set for Saturday against Barnet. But the former Aston Villa trainee wants to make amends after he was sent off against Leyton Orient and suspended for Tuesday's win against Plymouth. "It's almost been the perfect month for me," he told BBC Radio Oxford. "But, the sending off has made it a better loan really," he added. "I'm better off learning things like this now when I'm still young than later in my career during an important cup final." Graham was dismissed for a second bookable offence as he kicked a ball away against Orient. Oxford were unable to hang on to their two-goal lead, conceding an equaliser in stoppage time. 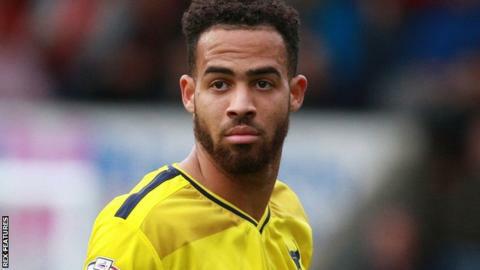 He admitted it was a "tough learning curve" serving his suspension against Plymouth, having to watch from the stands as Oxford beat the league leaders 1-0. "My dad told me these things happen to all players in football," he said. "I just have to learn from it and make sure I don't put my teammates in a position like that again. "But, I'm really enjoying my time here. I've been playing well, we've been winning and everyone's happy. "I've spoken to Wolves about how much I've enjoyed it and I think the paperwork's being sorted to keep me here a bit longer."